Weirdly, of all the terms describing chubby parts of the human body, only the beer belly fingers a specific food culprit. Why not pizza handles? Or donuts thighs? It's not like beer alone makes gives you a gut. In fact, a new study suggests your favorite brew can actually prevent weight gain! Take that, gut-shamers. 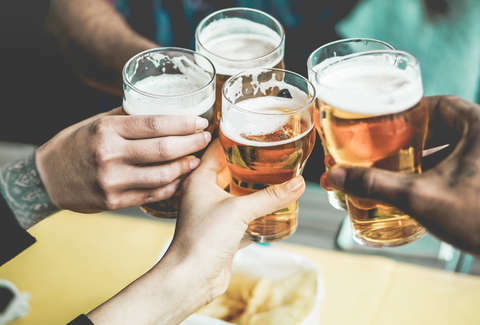 Published in the thrilling pages of Archives of Biochemistry and Biophysics, research conducted by scientists at the Oregon State university determined that xanthohumol, a flavonoid (lol wut) found in hops and beer, "significantly improved some of the underlying markers of metabolic syndrome in laboratory animals and also reduced weight gain." In simple terms, metabolic syndrome is a combination of obesity, high cholesterol, and elevated glucose linked to cardiovascular disease and Type-2 diabetes. Those are bad. In the study, scientists fed lab mice a high-fat diet along with varying levels of xanthohumol. All the mice gained weight while bingeing, but those also consuming xanthohumol gained 22% less weight. Additionally, they lowered “bad” cholesterol 80% and their insulin levels 42%. But really, all humans care about is how they look, rather than if they're really healthy. Ours is a very Dorian Gray society. Now, don't go thinking you should just go out and guzzle a six pack to shed your winter weight. While you can obtain xanthohumol through beer, a 150lb human would need to drink 3,500 pints per day to get the appropriate dose -- something only Wade Boggs can do on a cross-country flight. Maybe he's immortal? Regardless, this breakthrough could lead to dietary supplements that help fight getting fat and all the ailments affiliated with being obese. And it was all brought to you by beer! Ryan Craggs is Thrillist's Senior News Editor. If beer made him lose weight, he'd have looked like the guy from Thinner during college. Follow him @ryanrcraggs.